These are lyrics by Thompson Twins that we think are kind of repetitive. 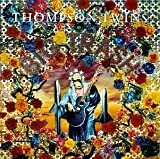 Thompson Twins', "Hold Me Now"
No, I will not! No matter how many times you ask! Me and Yasmine White sang together in music therapy. I love that video. During 'the bigger the better' it shows the telephone and an umbrella before Tom Bailey's face saying 'some stolen from Japan.' The faces of two other members zoom in when saying the chorus. Two Tom Baileys with an umbrella and a hat coming down. White apples and red apples, before it shows the rabbit. The leaves are rustling in the wind. The car revs up in the drive, so the car runs across the set. Alannah: 'The bigger,' Joe: 'The better,' before Tom Bailey disguised as Panama Jack saying 'some nicked from old Saigon' before adding himself three. At the end of the video, the nurse lets three members take a temperature by sticking a thermometer into the camera lens. I really love that!!! Thompson Twins', "Love On Your Side"
First song track off the album called 'Quick Steps & Side Kicks'...I mean Track 01!